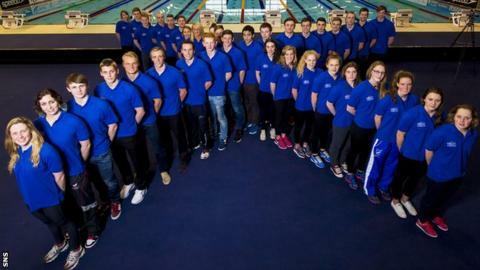 Team Scotland have named their largest aquatics team in Commonwealth Games history for Glasgow 2014. Of the 38 swimmers and two divers selected, 28 make their Games debuts. Among them is 16-year-old diver James Heatly, whose grandfather Sir Peter Heatly won three Commonwealth gold medals, a silver and a bronze. "There is a strong core of experience and success and I'm excited to see so many new faces," said Team Scotland chef de mission Jon Doig. "At this stage, it is the biggest single sport in Team Scotland for 2014." Scotland have claimed more medals in the pool than in any other sport in the Commonwealth Games, a total of 73, including 20 golds. And five of the athletes to make the team for 2014 have stood on the Games podium previously, adding eight medals to Scotland's tally. Caitlin McClatchey, double gold medallist from Melbourne 2006, will race in the 200m freestyle, while Robbie Renwick will bid to retain the 200m freestyle title he won in Delhi four years ago. Hannah Miley will defend her 400m individual medley title on the opening night of action at Tollcross International Swimming Centre on 24 July. Scotland is statistically the strongest nation in the world in the men's 100m breaststroke right now, with Ross Murdoch having demonstrated his pedigree by winning the event at the recent Scottish and British championships to go top of the world long-course rankings. Murdoch set a new Scottish record in the 100m and swam the fastest time in the world this year in the 50m, 27.28, in winning the 50m breaststroke at the Scottish Championships. Olympic and Commonwealth silver medallist Michael Jamieson will compete in the 100m and 200m breaststroke in Glasgow, having won the 200m title at the Scottish and British Championships in Tollcross. Ryan Bennett (4x100m Medley), Craig Benson (100m Breaststroke), Cameron Brodie (200m Butterfly), Martin Cremin (1500m Freestyle), Craig Hamilton (1500m Freestyle), Michael Jamieson (100m & 200m Breaststroke), Rory Lamont (50m Backstroke), Gareth Mills (4x200m Freestyle), Andrew McGovern (50m Backstroke), Kieran McGuckin (4x100m Freestyle), Craig McNally (200m Backstroke, 4x100m Medley), Stephen Milne (400m &1500m Freestyle), Ross Muir (400m Individual Medley), Ross Murdoch (50m, 100m & 200m Breaststroke, 4x100m Medley), Robbie Renwick (200m & 400m Freestyle, 4x100m Freestyle, 4x200m Freestyle, 4x100m Medley) Richard Schafers (50m Freestyle, 4x100m Freestyle), Jak Scott (4x200m Freestyle), Lewis Smith (200m Butterfly, 400m IM), Calum Tait (200m Breaststroke), Jack Thorpe (4x100m Freestyle), Mark Tully (50m Breaststroke), Daniel Wallace (400m Freestyle, 200m & 400m IM, 4x200m Freestyle), Joseph Welstead (50m Breaststroke). Diving: James Heatly (3m Springboard). Katie Armitage (100m Breaststroke), Kathleen Dawson (50m Backstroke, 4x100m Medley), Fiona Donnelly (4x100m Medley), Megan Gilchrist (4x200m Freestyle), Sian Harkin (50m Freestyle, 50m Butterfly, 4x100m Freestyle, 4x100m Medley), Camilla Hattersley (800m Freestyle), Lucy Hope (4x200m Freestyle), Kathryn Johnstone (50m & 100m Breaststroke, 4x100m Medley), Rachel-Louise Masson (4x100m Freestyle), Caitlin McClatchey (200m Freestyle, 4x100m Freestyle, 4x200m Freestyle), Hannah Miley (800m Freestyle, 200m Breaststroke, 200m & 400m IM), Rachel O'Donnell (4x100m Freestyle, 4x200m Freestyle), Corrie Scott (50m &100m Breaststroke), Andrea Strachan (50m Breaststroke), Aisha Thornton (800m Freestyle). Diving: Grace Reid (1m Springboard).